1999. Acrylic on stretched canvas. 24"x30". 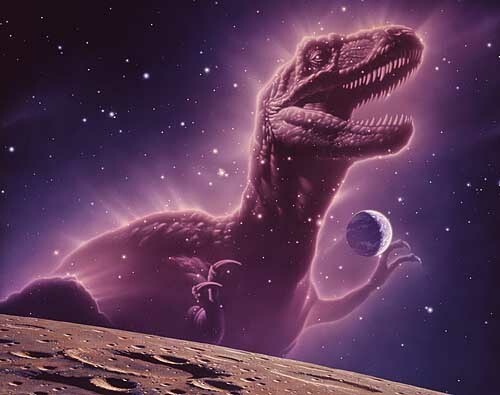 The ghostly image of a Tyrannosaurus rex looms over our home planet in this allegorical painting. Sixty-five million years ago, our earth and its moon looked much the same as they do at present. Yet at that time, life on land was very different from what it is now, for the Age of Reptiles prevailed and dinosaurs ruled the earth. Many creatures have left their mark on the tapestry of life on earth. The mammals have been the preeminent lifeform for the past fifty million years, and the ancient dominion of the amphibians lasted even longer. But the extraordinary dynasty of the reptiles endured for half of the long history of life on dry land, and for most of that time the dinosaurs reigned supreme. No other group of animals has ever dominated the surface of the earth to such an extent.